Community Stewardship As a core value CLARK has a governing principle of supporting our local communities through philanthropy and community service. CLARK recognizes the importance of being a good corporate citizen, the value of charitable nonprofit organizations in our communities, and we support them in various ways. By providing support for projects and initiatives that reflect the goals and values of our company, we enrich communities and help improve quality of life where we work and live. We believe our employees are among the most generous and compassionate people around. Each of our employees is given 12 hours of paid time off to make a difference in the community. From serving meals to the homeless, to helping veterans at the hospital, they are involved with over 50 agencies that are making an impact in the quality of people’s lives and making a positive transformation in the communities that we live. Several of our employees serve on the boards of nonprofit organizations and many of our employees are also involved in community organizations outside of working hours. CLARK is committed to lending hands that make a difference. CLARK ACTIVELY SUPPORTS THESE ORGANIZATIONS & MORE! We have partnered with numerous organizations and we are especially proud of our ongoing relationship with Susan G. Komen for the Cure and other organizations that support breast cancer research. Over the past eleven years, CLARK, our employees and dealers have raised over $350,000 for the cause with various initiatives. 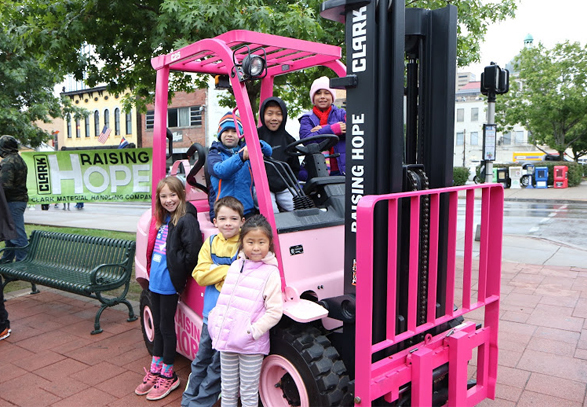 CLARK introduced Pink Forklift Trucks, Pink Pallet Jacks and Pink Burden Carriers to benefit breast cancer research and treatment. Breast Cancer is a disease that not only affects the patients' lives, but also the family and friends and CLARK is committed to supporting this cause.